Live display of grain moisture content during harvesting, eliminating the need to stop regularly and test moisture content. 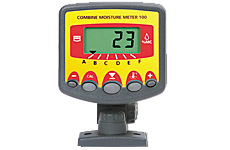 Fast and easy adjustment of moisture calibration to match reference measurements through the “nudge” function. Helps identify if conditions are, or are becoming, unsuitable for combining. Allows grain to be stored in the optimum location according to drying requirements. Can be calibrated for use with any combinable crop. Highly visible back-lit display and keypad for use in all light conditions. Six different channels enable calibration for up to six different crop types. Moisture calibration “nudge” function to manually adjust moisture reading to agree with a “reference meter” e.g. the meter at the grain store. Visual and audible alarms to warn off excess moisture.